In medicine, the term “evidence-based” hold a lot of weight. It is how every doctor should make decisions. This means that the result of a certain intervention, may it be a drug, a therapy, or surgery, has been proven by research studies. You want your doctors to use this kind of medicine as it is most likely to lead to the best result. The treadmill is one of these fantastic evidence-based tools and the article Treadmill Training of Infants with Down Syndrome: Evidence Based Developmental Outcomes gives us a method as well as expected results of this intervention. You may wonder why these babies are being put on treadmills long before even a typical child would be expected to walk…well this article shows that this intervention helps our children with Down syndrome walk a little sooner. The average age of walking for a child with Down syndrome is 23 months, whereas a typical child is 12-13 months. Walking is an important part of development as it changes the way the child is able to interact in their environment, specifically with other people like playing with children. I have heard from other mothers that as soon as a child learned to walk they blossomed in many other areas including language. I am ok with Noah walking when he is ready to walk, but I also want to give him every opportunity to explore on his two feet. He is already a rolling adventurer…you gotta watch out for this kid or the next thing you know he is under a couch. Look at this these little baby feet going! Our physical therapist brought up treadmill training to us and we got very excited. Her fabulous student Jill was doing research on the topic just for us. The idea behind treadmill training is to create the stepping reflex. The stepping reflex is making a stepping movement when the sole of the foot hits a hard surface. It is present at birth and is supposed to disappear around 2 months. Noah never had a stepping reflex when he was born which is common in children with hypotonia. There is research that shows that if a child has the stepping reflex continue past this point it can help them learn to walk a little bit sooner than expected. The baby learns a “practiced pattern” that he or she can apply once they are ready to walk. The one hinderance to evidence based medicine is that you can only use the statistics if you fit the criteria that the article used. One of their criteria is that the child can sit for 30 seconds prior to starting treadmill training. The treadmill was dangled in front of us for a few weeks before we were able to use it. Thank you sitting marathon, you are paying off today! This was used as a measurement of time assuming that children were developmentally similar at this time and the next major milestones would be what was encouraged by the treadmill training. The average age was about 300 days when the kids started the study. We forget shoes, so they made us some. The article actually used parents as the treadmill trainers and provided treadmills in each of the parent’s homes. They were tiny treadmills made just for this study. The parents were to use it 5 times per week for 8 minutes at 0.2 meters per second which is almost 0.5 miles per hour. When first starting, the children were not walking consistently for 8 minutes. They would walk for 1 minutes, rest, and try again until they could achieve the full 8 minutes. The parent supports the child over the treadmill so that their feet touch the ground and are moved back by the treadmill. The hope being that when their foot is too far behind them they will lift it up and put it in front of them. Eventually this will become a practiced pattern that the child has mastered. He’s starting to get the hang of it! controlled trial. This is the best of the best when it comes to looking for evidence. Of the three outcomes, two were statistically significant meaning that the results were not by chance based on the statistical analysis. Raising self to stand occurred at day 134 (from enrollment in the study or from when they were sitting for 30 seconds), which was 60 days earlier than the control, this however was NOT statistically significant. 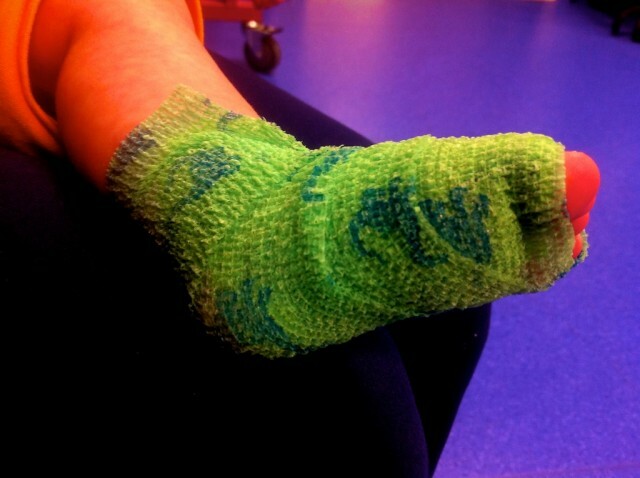 Walking with help occurred at 166 days, 73 days earlier than the control. And lastly, walking independently occurred at 300 days, which was 101 days earlier than the control. Both of these were found to be statically significant. Now that may not seem like a huge difference, but a little over 3 months is a huge difference when you are not even 2 yet. The average age of walking for those who went through treadmill training was 19.9 months and for the control group it was 23.9 month. The 4 months difference now is because we are not talking days from sitting anymore, but the actual age of the infants when they walk. The control group was slightly older. One of of my favorite things about this study were not just the results. Not one parent dropped out. Whether it was the control or the or treadmill training group they stuck it through to the end. Not many studies can boast that kind of result. I think that says a lot about the parents that raise children with Down syndrome; they don’t give up and they are willing to put in the work. Go team! 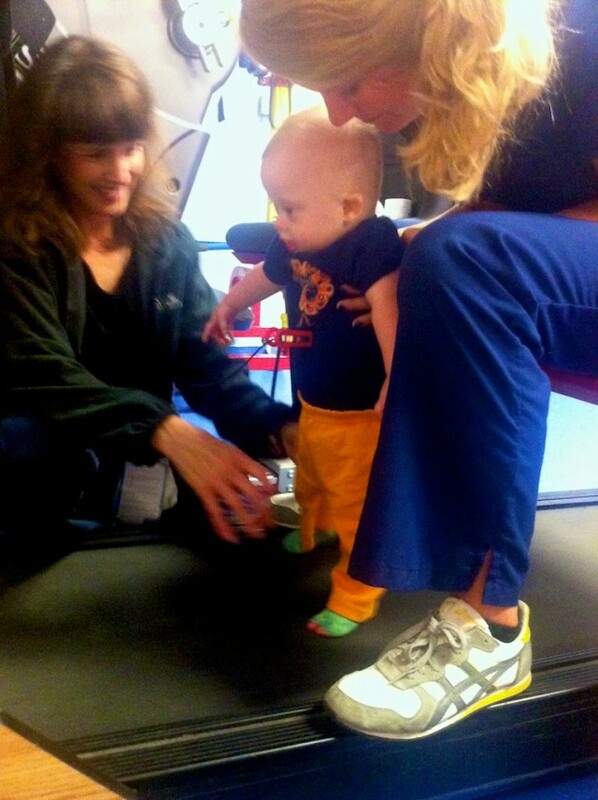 We are far from following the method as we only have a treadmill at therapy and we go twice per week, but we are trying to help Noah learn to put one foot forward, and when he is ready may it be at 19 months or after his 2nd birthday we will celebrate him walking independently. Have you used the treadmill for your little ones development? What are some of your favorite physical therapy tools / techniques / exercises? Thank you for the post! It has never occurred to me to use our treadmill for Alyson’s therapy. I will be asking Mary Ellen, Alyson’s PT, what her thoughts are on this and perhaps we will be integrating this into her therapy. I will keep you posted on this. Do you have the actual study report so I can read this over myself? I am very excited to start this! If you click the title of the article above it should take you to it. If not it is a free article if you type the title into google it should pull up 🙂 hope your PT is all for it. I am very interested in this…. Athena is only a month old tomorrow but I want to be up to date on all of her trials and tribulations b4 they come upon us…. keep up the gr8 work!!!! How’s everything going with Athena? Heart ok? Here’s a link to parent and therapist friendly info on treadmill training for kiddos with Down Syndrome. It gives all the details in a way that is accessible to all. The challenge to me is giving families access to treadmills. We started Clara on treadmill training when she was 14 months old and she started taking independent unassisted steps when she was 18 months old. Shortly before she turned 2, she was walking independently full time. With assistance of a good friend, we consistely did 4 to 6 days per week. In the beginning, Clara would be on the treadmill for 1 minute followed by by a 1 minute rest period, with each session lasting a total of 15 minutes. She complained quite a bit during the first several sessions, but gradually became accustomed to the routine. The treadmill was intially set at a pace of half a mile per hour with no incline pursuant to the University of Michigan research. 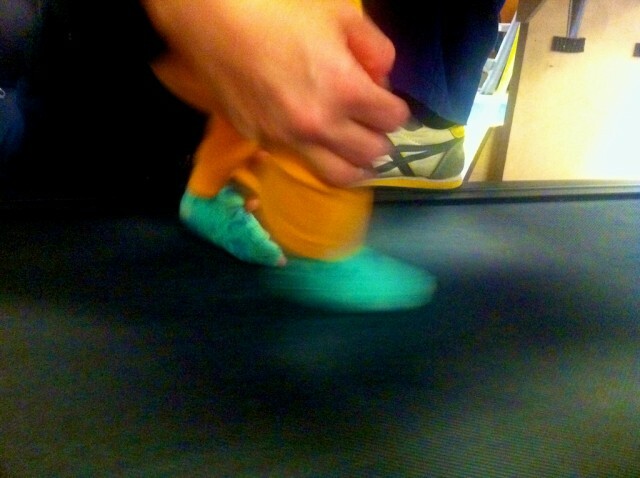 After 4 months of treadmill training, she was easily walking for 10+ minutes at faster speeds and with slight inclines. My son’s physical therapist did this with him! He had very high muscle tone and didn’t crawl until 11 months and walked at 19.5 months. I think the treadmill helped him immensely!!!! I just saw your reply to our post as I was reviewing the post today, that is so awesome that he walked so early. Noah is nearing the 19 month mark and he just started walking with us holding his hand so we will see what happens 🙂 Thanks for sharing your story. Thank you so much for your posts! I just found your blog last night and am eagerly going through your videos. Our daughter, Natalie, is 15 months old and is just starting to reach and roll crawl. This is very cool.. i actually thought about this but not until after she learned to walk at 26 mo. I was told that the proper crawl was the most important for development and not to push the walking as it would come. She will be 3 day after christmas and is doing great..
Glad to hear your daughter is doing well!